Great news! Our school has been voted through to the final (held in London on 12th February). 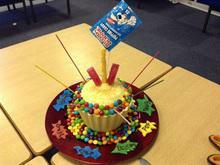 Miss Patterson and our Year 6 pupils created a masterpiece with a noisy cake! It had popping candy, whistle lollies and sparklers!